Java Cafe The Session 03-02-08. Hosted by MC QBall. 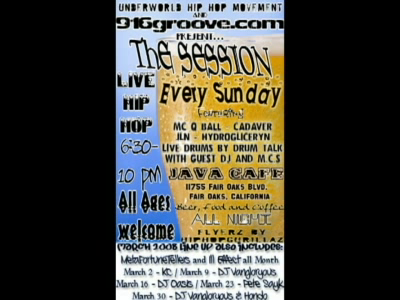 MC QBall, JLN, Metefortunetellers, Cadaver, and Ill Effect. Filmed and edited by Matthew Hollstein - 916groove.com. We Be Music Video by MC QBall916. Filmed and edited by Matthew Hollstein for 916groove.com.